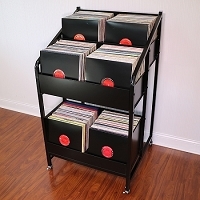 The LPBIN2 vinyl record storage cabinet has black powder coated 18 G.A. steel shelves with durable black, industrial, long grain particle board sides. 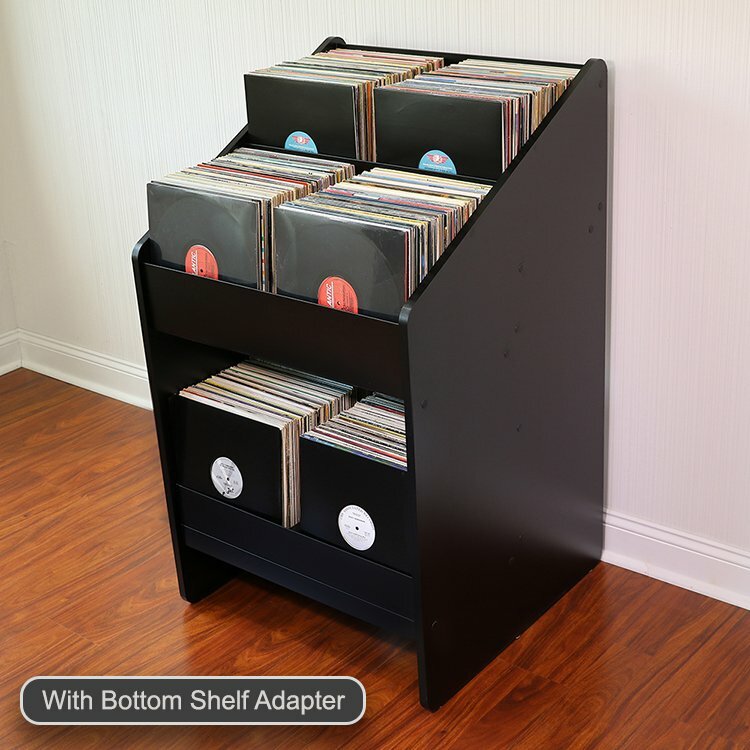 The raised back bin will make it easy to browse and select your LP’s. The bottom shelf will give you easy access to records stacked vertically in a row. Perfect for large box sets. The bottom shelf is 13” deep with a 13” back. Storage capacity is about 560 Vinyl Records. We used standard 12" single records in cardboard sleeves. The total capacity will vary with each collection. We recommend measuring your collection. The LPBIN2 will hold a 6’ 10" row of LPs. Assembly will take about 20-30 minutes following the one page, illustrated instructions. 13" deep bins make it easy to browse your collection. Two removable center dividers included. Add GrooveMats to your LPBIN2 order. The GrooveMat is a thick Grooved Vinyl Mat that fits perfectly in the bottom of your LPBIN2. Your records will be easier to browse. The Vinyl Grooves will hold your collection in place and prevent any movement. You can now fill rows half way and not worry about them sliding forward. Keeping your LPs vertical is the best way to store your collection. Excessive leaning will cause warping over time. The GrooveMat will allow you to maintain 100% vertical LP storage. The LPBIN2 Bottom Shelf Adapter converts the bottom shelf into a front facing bin. The bin will be exactly like the one above. After installing the adapter, you will have a additional front facing bin to organize you LP collection. Installation is easy with just a few screws. 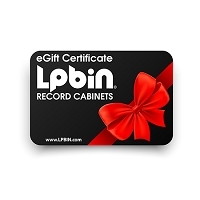 The adapter can be added anytime after the LPBIN2 LP Storage Cabinet is assembled. A center divider is also included. My records are off the shelves and organized. The best part is flipping to find stuff...easy to access. I bought the bottom shelf adapter and it gives more front facing storage. Very sturdy and it shipped out fast. This is 80% metal, in case you wondered. Solid construction, a bit heavy for some, but a PITA to assemble. You need at least 2 other hands, if not 4. I bought 2. 1st one took the longest; start getting the hang of it, by the 2nd one. I personally wish it had lights or other bells and whistles for what you're paying for, but overall it's worthy of purchasing; just for the display factor alone. 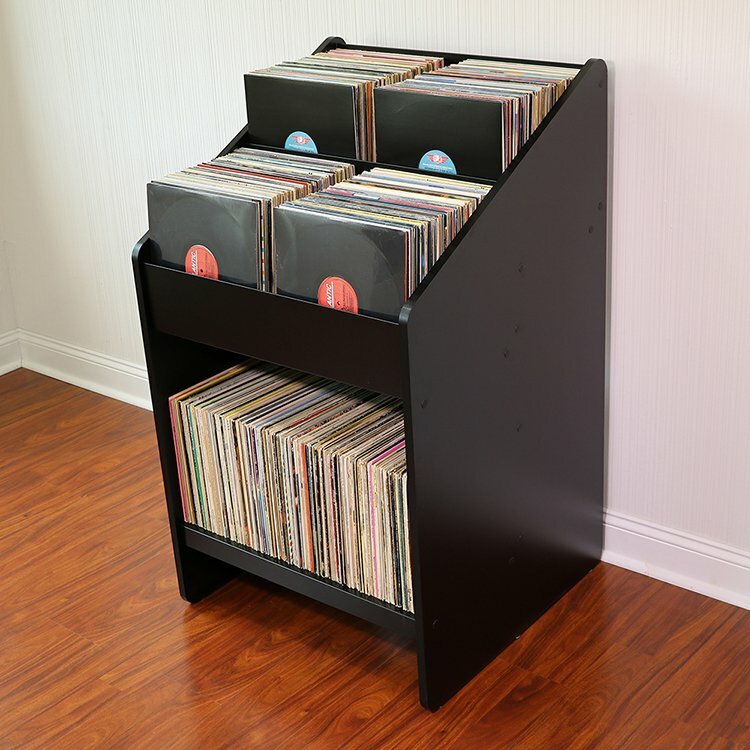 Better than bookshelving your records, which I loathe. Death to IKEA and the sheep who go there! This is the best lp cabinet out there. it arrived by FedEx double boxed. Assembled in a few minutes. Definitely a 2 person job to assemble it. Arrived by Fedex 2 days after i ordered. Assembly was pretty fast. looks great and i need another one soon.